Located a few minutes south of Prescott in the tall pines. Lot has an easy slope; great for year around living, or second home. Neighboring homes in area are well maintained. 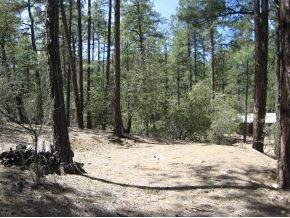 If you're looking for a pine home-site close to town & off the beaten path check this one out. Well or other water source needed, on site waste water system required. Owner will consider a carry back with 25% down. Submit terms for consideration. Senator Hwy left on Oak Knoll, R-Woodland, R-Cedar, R-Forest, L-Skyline, NE Corner Skyline & Forest next to green painted home.